Macao (Macao SAR) – March 15, 2018 (travelindex.com) – Global Tourism Economy Research Centre (GTERC) just made its annual presence at ITB Berlin, the world’s largest travel trade show, to promote the 2018 edition of the Global Tourism Economy Forum (GTEF or the Forum), the first forum to discuss global tourism economy in the context of China’s far-reaching Belt and Road Initiative. Pioneering topics at the top of the public-private agenda, and focusing on creating opportunities for tourism promotion, investment and cooperation, GTEF 2018 will be held in Macao on October 23 and 24 under the theme of “Strategic Partnership in a New Era, Rising Momentum for a Shared Future”. An official event supporting the 2018 EU-China Tourism Year (ECTY 2018), GTEF 2018 will present two of the most vibrant economic regions of the world. Besides showcasing the European Union (EU) as Featured Partner Region, this edition will also highlight the Guangdong Province as Featured Chinese Province in support of the Central Government’s plan for the development of a city cluster in the Greater Bay Area. GTEF 2018 will use its pragmatic tourism exchange platform to drive discussions on strengthening EU-China commercial and cultural exchanges, and to provide opportunities to build EU-China cooperation and partnership through bilateral trade meetings, business matching, networking, workshops, exhibitions, etc. 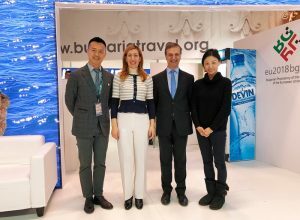 Entering into its 52nd edition, ITB Berlin provides a platform for over 10,000 exhibitors from over 180 countries to connect with global tourism peers and explore cooperation opportunities. During ITB Berlin, GTERC representatives met with tourism and economy officials and industry leaders from numerous European countries including Ms. Nikolina Angelkova, Minister of Tourism of Bulgaria; Mr. Gari Cappelli, Minister of Tourism of Croatia; Mr. Tarmo Mutso, Director of Estonian Tourist Board of Estonia; Mr. Zoltan Kovacs, Director General of Tourism Section, Ministry of Transport and Construction of the Slovak Republic; Mr. Ricky Wohl, Director General of Tourism, Ministry of Economy of Luxembourg; Mr. Filipe Silva, Board Member of Turismo de Portugal; Ms. Alessandra Priante, Head of International Relations for Tourism Policy and Italian Cultural Expert for the Gulf Region, Directorate for Tourism, Ministry of Culture and Tourism of Italy; Mr. Alexander Stedtfeld, Deputy Head of Unit, Tourism Policy, Department for SME Policy, Federal Ministry for Economic Affairs and Energy (DZT) of Germany; Mr. Burkhardt Kieker, Chief Executive Officer of VisitBerlin; representatives of Visit Holland, Visit Finland and Visit Sweden; as well as Mr. Eduardo Santander, Executive Director of European Tourism Commission; Mr. Norbert Fiebig, President of The German Travel Association (DRV) of Germany; and Mr. David Axiotis, General Manager of ITB China. These meetings served to introduce cooperation opportunities offered by the Forum, and to enhance the European stakeholders’ understanding of Macao’s reinvented international image and its world-class MICE capabilities. The Global Tourism Economy Forum (GTEF) is hosted by the Secretariat for Social Affairs and Culture of the Macao SAR Government, co-organized by the China Chamber of Tourism under the authorization of All-China Federation of Industry and Commerce (ACFIC), and coordinated by GTERC in collaboration with UNWTO. GTEF’s supporting units include the Liaison Office of the Central People’s Government in the Macao SAR, Office of the Commissioner of the Ministry of Foreign Affairs of the People’s Republic of China in the Macao SAR, China National Tourism Administration (CNTA), World Travel and Tourism Council (WTTC), Pacific Asia Travel Association (PATA), World Tourism Cities Federation (WTCF), European Travel Commission (ETC) and Macao Government Tourism Office (MGTO). Since its inception in 2012, GTEF has successfully established itself as an influential high-level cooperation platform to promote sustainable development in the global tourism industry with a focus on China. To date, GTEF had received 3 more than 8,000 participants from 83 countries and regions, including delegations from 105 provinces and cities of Mainland China; and 437 internationally renowned speakers.